Georgian military has participated in a tender announced by Saudi Arabia for designing an armored car. Otar Chiteishvili, the head of the foreign trade department of the Georgian Military Scientific and Technical Center "Delta", said on August 28 that the sketches with technical characteristics were sent to the tender commission on August 26. "An armored vehicle is designed for the evacuation of wounded servicemen from the battle area," he said. In case of winning the tender, the Georgian side will provide Saudi Arabia with 600 armored vehicles during the first year, but a few thousand vehicles within the contractual 10-year period. Tender announced by Saudi Arabia will continue till September 18. The winner will be announced in the late September or early October. "Delta started building the international network of sales a year ago, within the framework of which it mainly cooperates with the representatives of 22 countries in Africa and the Middle East," Chiteishvili noted. "These countries inform the Center about their announced tenders," he said, adding that Delta also holds negotiations with several other countries. Chiteishvili went on to note that tangible negotiations are also held with Egypt in connection with the delivery of 64 patrol types of armored vehicles. 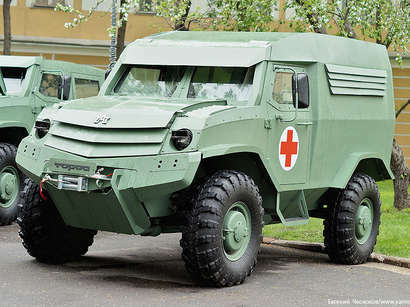 It was reported earlier that Iran is interested in purchasing "Didgori" armored car from Georgia. However, Delta rejected the report.